Nadia and Sayed meet just as their country is fracturing into a terrifying civil war, and as their love grows, their city becomes a war zone right before their eyes. When they hear rumors about doors that take people away, to somewhere far away from the chaos around them, they decide to learn more. This is the beginning of the adventure the two of them journey on together as they escape from the terrors in their hometown and find themselves in a new place every couple of months. 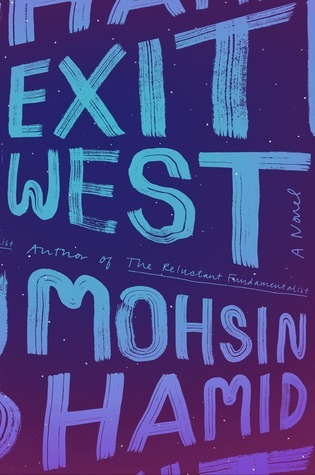 There is no doubt that the premise of Exit West is extremely compelling and unique; in fact the interesting premise is the exact reason I decided to pick up the book. While I enjoyed a few things about this novel, overall I was more in the camp of finding it unsuccessful than many other readers. What I really liked about the book was the writing – it was a really cool mix of poetic and concise, telling the reader exactly what he/she needed to understand while at the same time telling the story in a beautiful way. Honestly I may have been more annoyed with the book overall if the writing hadn’t been so gorgeous. I also liked the relationship between Nadia and Sayed, especially in the beginning – I loved reading as they got to know each other, as their relationship developed from friends to dating to something much more serious. I found it fascinating how they managed to navigate their lives and their relationship despite the fact that it felt as though the world was collapsing all around them. Ultimately my issue with the book was that I felt it was almost two separate books – did the author want to write a book about war, or did the author want to write a science fiction-y book about doors that take people to new places? I had hoped that these two concepts would come together in a way that I found cohesive, but unfortunately I didn’t personally find that to be the case. There were also some issues that I had with the later parts of Nadia and Sayed’s relationship, but I feel that these details are a bit spoiler-y so I’ll avoid the specifics. I have to say that despite my issues with the book, I did enjoy the experience of reading it. But since the main thing I didn’t like about the book is pretty much the core of the entire thing, I find that to be pretty important. A lot of readers have loved this one, so don’t take my word for it – try it for yourself and come back to tell me what you think. 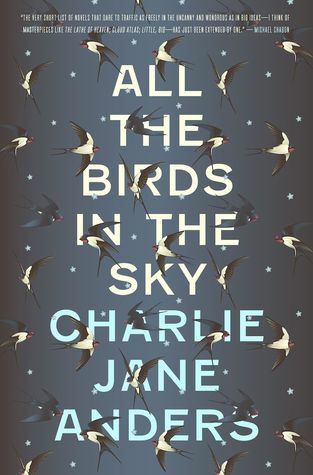 There were things I liked about this book and things I disliked, but overall I have to say that I was not wowed by All the Birds in the Sky. In short, I liked the beginning of the book and the end but not so much the middle. The beginning is set during Patricia’s and Laurence’s childhoods, and it reads almost like a YA book. Like a really dark and sad YA book, I guess, as there is abuse, bullying, and a general feeling of darkness that runs alongside the story. There were certainly moments of fun and humor, but neither of the two really had great childhoods, and Anders doesn’t shy away from showing the reader just now not great things were for them. I liked the two of them as kids – they were both awkward, shy, basically two nerds who really connected with each other. Something that bothered me about the beginning, even though I generally liked it, was that the abusive and destructive behavior of several characters was never discussed in-depth or dealt with in any way. There were some scary things that happened to these characters, stuff that was pretty much ignored and never talked about again. It did not ring true for me at all. The transition in the book from their childhoods to adulthood felt shaky and really took me out of the story. And once we got into adulthood, I almost put the book down several times. It felt to me like it wasn’t going anywhere, like it was rambly and not much was happening and I was just, frankly, bored by it. But there was one point where THINGS start happening, and I drew back into it, and I did really like the last third of the book. The end of the book really shows the world falling apart, and it was scary but I loved how Anders described the slow unraveling of everything we know to be necessary in modern life. That part reminded me a little bit of Emily St John Mandel’s Station Eleven. I liked the clashing of science and magic, and I liked how Patricia’s magic wasn’t this huge fantastical thing, but rather a minor element of her personality that came in handy sometimes and in some major ways. There’s also a particular element of the book, it’s a minor plot point but quite a spoiler, that I absolutely loved. One of those connection things that you go “ah!” as you read it. So overall – not my favorite book, but I did enjoy parts of it. I’m glad I read All the Birds in the Sky and would still consider reading something else written by this author. 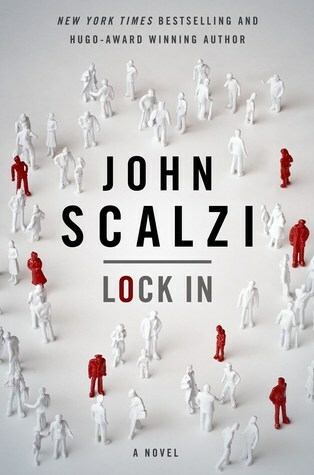 This was my first time reading a book by John Scalzi, and I’m excited to say that I quite enjoyed it! I’ll be looking for more books by him that are equally awesome, so if you can recommend one, please say so in the comments below. Now onto thoughts about Lock In! The world that Scalzi created here was so intriguing to me. 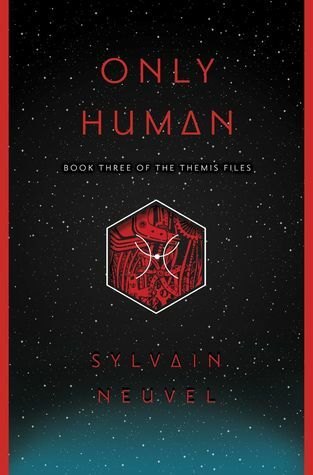 I think these kind of dystopian/futuristic novels are my favorite – ones where it’s entirely conceivable how the world got to where it is, the author gives a background on how and why things are the way they are, and the people in the story have mostly adapted to this new way of life. That’s exactly what we have here – this insane virus changed practically everything about the world these characters inhabit, yet things have basically returned to normal with a few changes. I couldn’t get enough of the details about the Hadens – how they adapted to their new bodies, how the world has changed to make room for them in everyday life, how they have relationships with Hadens and non-Hadens – all of it, I soaked up every single word. Scalzi does something unique and extremely awesome with gender here. Not once in the entire book is it made clear whether Chris Shane is a man or woman, and the publisher actually put out two different versions of the audiobook – one narrated by a guy (Wil Wheaton) and the other by a girl (Amber Benson). I listened to the Wil Wheaton because I loved him narrating Ready Player One, so to my ears, Chris Shane was male. But I’m assuming if Amber Benson had narrated my book, Chris Shane would have been female to my ears. And I’m super wondering how I would have interpreted it if I’d read the print and made my own assumptions about Chris Shane’s gender. The point? Gender doesn’t matter! And I love this so much, and I want more books that showcase this in a creative way. The characters in this book are great. Chris Shane is privileged and naive, and learns throughout the course of the book just how privileged and naive, which is a fun journey to watch. Shane’s partner, Vann, is damaged and dark, the kind of person who clearly needs and craves friendship and love but won’t allow herself to deserve it. But she’s also incredibly cunning, clever, and a damn good FBI agent who is a great teacher to Shane. I loved their partnership and their bantering back and forth as they got to know one another. As far as the mystery itself goes, that was probably the weakest aspect of the book. It wasn’t a huge shocker who committed the murder and why, and I didn’t feel that the lead up to the big reveal was done with a ton of effort on Scalzi’s part. However, I totally didn’t care. I loved this world, the characters, the snappy dialogue, and Wheaton’s narration was the icing on the cake. I would have followed this story anywhere, so the mystery itself was just running alongside everything else that I was really loving about the book. Overall – I loved it! Jenna and Lucas are forced to attend summer camp by their parents. Once they arrive, they quickly realize two misfits are better together than apart, so they form a fast friendship. Things at camp seem okay for a while, but suddenly the two of them see some strange happenings – kids are disappearing, others are becoming strangely much smarter than their normal selves, and they see counselors sneaking into campers’ cabins at night. Jenna and Lucas quickly realize that they must get to the bottom of this before whatever is happening starts to happen to them too. Typically, graphic novels are targeted toward a pre-teen and teenage audience, and while I’m much older than that, I tend to still get some kind of takeaway from them. Unfortunately, that wasn’t exactly the case with Brain Camp. While I didn’t dislike the book, I didn’t find anything of particular significance in it which admittedly made it difficult for me to really sink into the book. I think the issue I’m having with Brain Camp is that I wasn’t expecting it to have such a strong sci-fi/body-snatchers vibe. Definitely this is my problem and not the book’s, but all the same when I understood where the plot was going I was not exactly thrilled. I don’t love these kinds of stories so I wasn’t surprised when I closed this book feeling less than excited about it. But the good news is that this is just my opinion, based on my own bias toward these types of stories, which I almost never enjoy anyway. Brain Camp itself had really great artwork which I definitely liked, and an important message at its heart about how difficult it can be to fit in and how it’s so crucial to just be yourself even during those painful teenage years. So, yes, there are valuable and even excellent things about this book. But for me, I wasn’t jumping up and down about the overall experience. So, while Brain Camp wasn’t my favorite graphic novel by a long shot, readers looking for a more lighthearted, funny story that involves some sci-fi elements will probably enjoy this one much more than I did. I’m beyond behind on my reviews, so I thought I’d do another edition of mini-reviews in an attempt to catch up. None of these books were sent to me for review, I acquired them all by the library, bookstore, or in one case through a giveaway. 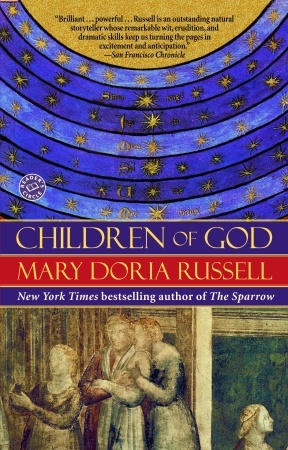 First up is Children of God by Mary Doria Russell. This is a reread for me, and I actually reviewed it years ago, so I won’t say too much here. It is the sequel to The Sparrow, my all-time favorite book. I like Children of God, although not nearly as much as its predecessor. My biggest problem with Children of God is the fact that most of my favorite characters are absent, and I spend about the first half of the book missing them tremendously so I find it difficult to get to know and love the new characters. But I do think that it completes the story set in motion in The Sparrow, and it is a must read for fans of the first book. Next, The Stuff That Never Happened by Maddie Dawson. I picked up this novel based on the glowing reviews I’d read from several bloggers, and I’m glad I did. This is a compelling and believable story about a marriage built upon deceit and years of covering up secrets. From the outside, Annabelle and Grant have the perfect marriage and the perfect life, but what people don’t know is that after almost thirty years of marriage, Annabelle still harbors feelings of love for someone from her past. When she leaves Grant to care for their pregnant daughter, all those feelings resurface and she has to honestly figure out what she wants and what she’s willing to do to get it. The characters in this story made it excellent for me, they were so well drawn, so precise and flawed to the point of absolute believability. I raced through this one and would absolutely recommend it. Things I’ve Been Silent About by Azar Nafisi took me forever to finish, which is probably why I thought it was just okay. I listened to this one on my iPod for what seemed like months, but was actually about four weeks, and although I enjoyed parts of it, I found myself distracted and bored throughout a lot of the narrative. I really enjoyed the parts about the political situation in Iran throughout the years, but honestly Nafisi’s family drama got to be a little much after awhile. By the time I was halfway done with it, I just wanted to move on to another book, so my own impatience probably had a lot to do with my feelings towards the book. I’d be willing to read more from this author, but this book in particularly wasn’t one of my favorites. The Handbook for Lightning Strike Survivors by Michele Young-Stone, on the other hand, I definitely liked. The story is told in alternating viewpoints from Becca and Buckley, both of whom survived being struck by lightning as children, and their stories are very different but have many elements in common. And while they grew up in different times and in different parts of the country, you can probably guess that at some point throughout the story they meet and realize they have a lot in common. The circumstances surrounding their meeting are just as quirky and interesting as the book itself. This novel is sort of “out of the box” from my typical fare, but I really did enjoy it and am happy I gave this story and these excellent characters a chance. I loved, LOVED The Patron Saint of Butterflies by Cecelia Galante. This novel is about 14-year-old best friends Honey and Agnes, growing up in the Mount Blessings religious commune. Agnes is completely indoctrinated in the lifestyle, to the point that she punishes herself for her sins by fasting and sleeping on rocks, while Honey is not sold on the religion and spends entire days dreaming up ways to escape. When Agnes’ grandmother, who does not live among the community, learns of some of the atrocities going on at Mount Blessing she whisks the girls away, against Agnes’ wishes. There comes a point in the story when each girl must decide for herself what to believe and how to live her own life. I have to be honest, I could NOT put this book down. These characters were so intricately drawn, so interesting and fantastic, I loved both Agnes and Honey in different ways. 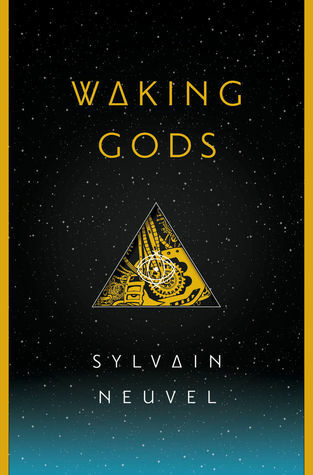 And the story absolutely fascinated me – who isn’t fascinated by the idea of a religious commune? I know I certainly am. So, yes, this one is a total winner in my book. Promise Not To Tell by Jennifer McMahon, on the other hand, I did not love. I’ve had this book on my radar for a long time so when I saw the audio at the library I decided to pick it up. Unfortunately, the story just did not click with me. While I liked the main character, Kate, the mystery aspect of the book had a lot of strange elements and felt very contrived. Basically the story is that when Kate was a child, a friend of hers was killed. Twenty or so years later, she comes back to her hometown to care for her Alzheimer’s-afflicted mother, and another young girl is killed in a similar way. There was a supernatural element to the story and I don’t think that aspect was done very well. The audio production wasn’t bad, Celeste Ciulla was the narrator and she did a pretty good job channeling the personality of Kate. Just, overall, I didn’t fall in love with this book. War on the Margins by Libby Cone is another book I’d been meaning to read for a while, and unfortunately I felt rather ambivalent about the experience when I finally got around to reading it. The book focuses on the Nazi occupation of the channel islands, Jersey most specifically. There were elements of the book I liked – I do enjoy reading about history, World War II in particular, and one character in particular, Marlene, I really connected with. But overall I couldn’t get myself invested in the book. I would pick it up and read only a chapter or two before finding myself disinterested and I’d have to put it down again. I’m not sure if it was the structure of the story, or the pacing, or what, but something just did not work for me. I want to point out, though, that the issues I had with this novel are specific to my reading experience and I do think it would be a worthwhile read for fans of historical fiction. It just wasn’t the perfect book for me. I first read The Time Traveler’s Wife about six years ago, when it was first published, and ever since then I have counted it among my favorite books. I was a little nervous to reread it, because I know that at twenty years old, I was a much different person than I am now, and perhaps my enjoyment of it might have diminished with the years in between. I needn’t have worried because the novel was everything I remembered it to be, and I loved it just as much, if not more than, I did the first time I read it! If you are unfamiliar with the plot of this novel (hard to imagine anyone would be, but just in case…), the story centers around Clare and Henry. Henry is a time traveler – although his time traveling is completely involuntary, sort of like a genetic disorder. One minute he’ll be in his normal life, the next minute he will be sucked into the events of twenty years ago, for example. And when he’s back in time, he’s completely a whole person – the people there can see him, talk to him, touch him, etc. Anyway, Clare meets Henry for the first time when she is a kid – he time travels into her backyard – and in Henry’s present, he and Clare are married. So Clare effectively knows Henry her entire life, and she knows from a young age that she is going to marry him. Henry meets Clare for the first time in his present at age twenty-six. It sounds confusing, but Niffenegger makes it flow really well, so it’s not confusing at all when you’re reading about it. This novel really is the ultimate love story. It is a tale of epic love, of love that knows no bounds, of love that literally never dies, of two people destined to be together regardless of the hell they have to go though (individually and as a couple) to make that happen. The way their love changes and grows over time and goes from innocent first-time love to a mature and stable marriage is a joy to read about. Having read this novel twice now, I feel that I KNOW these characters. I feel like they are a part of my life, like we were friends once or something. This will give you a good idea of how well they are written, about how realistic Henry and Clare are in this story. Because their story felt so real to me, I must admit that I bawled like a baby for the last 100 pages of the novel. I haven’t cried like that while reading a book in a long time. This book just does that to me. Anyway, I still love this book. If you haven’t read it yet, please do. Whether you love or hate it, I want to know your feelings and why! Because seriously, folks, this is one amazing novel. Please read it for yourself to find out why. I’m always really bad at making lists of my favorites of anything. If asked my top ten favorite movies, books, songs, foods, etc., the lists would almost always change from one day to the next. I don’t know why, I’m finicky about these things I suppose. But without fail, The Sparrow ends up on my favorite books of all time list every single time I try to think of such a list. This book, to me, is flawless. I love everything about it, and I’m almost afraid to talk about it because I get a little tongue-tied. How does one explain a love this strong? It’s like asking me why I love my husband… I can’t put words on it, I just do. But I suppose, for all of you, I will attempt an explanation. For anyone unfamiliar with the basic plot of the book, here it is in a few sentences. In the year 2019, scientists discover life on another planet, in another galaxy, in the form of radio transmissions from this planet, which is called Rakhat. As the government tries to determine a course of action, the Jesuits quietly assemble a team to go to Rakhat on a semi-secret mission. The party includes four Jesuit priests, a 65-year-old scientist and his doctor wife, a former prostitute-turned- scientist/technician, and a musician (the aliens are singers; after all, they discovered them via radio transmission). The party makes it to Rakhat successfully, yet interspersed with learning about their mission we also learn that only one person returned – Emilio Sandoz, the brainchild of the operation and one of the priests. The book goes back and forth between the present day, after Emilio has returned, and the past, from the beginning of the discovery to their time on the planet. Let’s clear one thing up first, shall we? If you do not like science fiction, do not, I repeat, DO NOT let that stop you from reading The Sparrow. This novel is so much more than a story of traveling to another planet. There are so many amazing things about this book, and honestly, the plot is sort of the backdrop for everything fantastic about it. 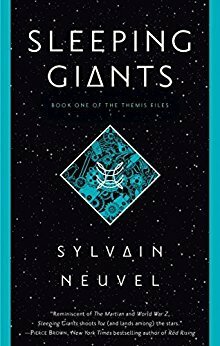 The characters are wonderfully drawn, so very realistic and they stuck with me long after I read this book the first time. Their personalities and their conversations just felt so very real to me – Russell definitely has a talent for creating authentic people, people that you want to get to know and be friends with and read about forever. And this plays a huge role in the emotional impact of the novel – after all, we find out in the first chapter that only one of these amazing characters came home from Rakhat. Another thing I want to clear up is that although the book centers around a bunch of Jesuit priests, this is not a religious novel by any means. I suppose you could take it to be religious, if you look at it a certain way, but I guess what I mean is that it’s absolutely not preachy at ALL. The book asks a ton of big questions but doesn’t provide any answers… it is up to the reader to come up with his/her own answers. So many passages in the book hit home for me, I couldn’t even begin to start quoting them for you. But now that I’ve read it twice, I can say that I picked up on even more poignant scenes than the first time I read it.